A humorous introduction to Christianity which invites readers to open presents from the Father, Son and Spirit. Buy it, read it, give it away! 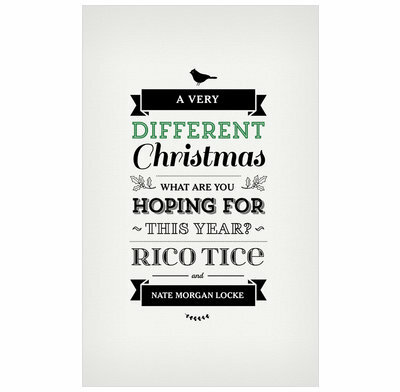 A humorous introduction to Christianity by Rico Tice and Nate Morgan Locke which invites readers to look at the presents under God’s tree. They’ll discover some very different things about God, about themselves and about Christmas, and how Jesus really is everything they could ever hope for. This page-turner is accessible for those who have never heard the gospel before, and gripping for those who think they have heard it all before. Ideal for giving away to friends and family as a gift, and cheap enough for churches to buy to give out at services this December (bulk deals available). Buy it, read it, give it away! Immediately engaging, this excellent little book will take you to the very heart of Christmas. Rico extends a warm invitation to see beyond the traditions of Christmas and find something that will last far longer than any present under the tree. ‘A Very Different Christmas’ offers an easily accessible look at the gifts our loving, generous and merciful God offers to every single one of us. Read it and have your mind stirred and your heart warmed. I will be giving this superb book away to enquirers with confidence and expectation. Profound while being simple, engaging without being patronising. A great book to give to a non Christian friend to get them to think about the best gift they could ever receive. It's written in a personable and relatable way. As an Evangelist I read many books that focus on sharing the gospel, many fail to clearly present the message of Jesus in a engaging and truthful manner. This book, however, is brilliant! It is clear, engaging and faithful to the gospel. If you want a non-Christians to understand the good news, then give them a copy of this book. An excellent book. Short, good to read and lays out the gospel clearly and unflinchingly. Highly recommended. We put several of these books on our reception table at our mums and toddlers group. Obviously I read it first! I liked the presentation of the book "cover" and thought the way the chapters were presented (little gift tags) was novel and it appealed! Two of our books were taken and hopefully read. Have kept the others for next year.The content was spot on! Thank you. What a gem of a book! The chapters are short but comprehensive and I loved the way each started with some sort of illustration to draw the reader in - this gave it the feel of a cosy chat with a friend. Having said that, the book pulls no punches, presenting the gospel message clearly, concisely and compellingly. We purchased 100 of these to be given away at our evangelistic Christmas events but I also recommend it to believers who wish to refresh their focus during the hustle and bustle of the Christmas season. I enjoyed this little book quick to read and kept to the point. I gave it to several friends for Christmas. The book gives a clear presentation of the meaning of Christmas using the Trinity as the foundation. However, I could not help feeling as I read the illustrations that this book is limited to a middle class readership. I bought 100 copies to bring with me on mission to the Kenyan coast but on second thoughts felt it was not right for this audience. I would be reluctant to use on social housing door to door work. Having said that I will of course make sure that many of my non Christian and atheist friends get a copy. This is certainly a thought provoking presentation of the Gospel message and gets the Christmas message over with clarity. I loved this book. The setting of Christmas round the tree was lovely but the way it brought the message of God's love for us and the gifts we receive from the trinity to the forefront of our thoughts was so well done. It was easy to read and wonderfully written. I would recommend to anyone and it will be one I reread again and again.